The Flying Spur is traditionally Bentley's most dynamic sedan and has often showcased top-line technology in past renditions. This new debut for the model is no exception, featuring powerful performance, top-end driving dynamics, and forward-looking technology under the dashboard. Don't let the posh levels of comfort fool you, the new Bentley Flying Spur is not your grandfather's lumbering estate car. Under the hood of the new Flying Spur is a 6.0-liter, twin turbocharged, 48-valve W12 putting out 616 bph and 800 Nm of torque. This is the latest version of the venerable and unstoppable W12 featuring a new Bosch ME17 engine management interface to improve torque management, turbo control, and emissions performance. This powerhouse couples to a new 8-speed transmission from ZF - the standard in all new Bentleys with its state-of-the-art seamless shifting and power delivery. All of this power translates to a top speed of 200 miles per hour (322 km/h), a zero to sixty of just 4.3 seconds and a zero to one hundred of 9.5 seconds. All while improving both fuel economy and CO2 output to a combined cycle of 19.2 mpg and 343 g/km respectively. To go with all of this muscle, the new design of the Flying Spur features a striking combination of Bentley's traditional luxury look with a more aggressive appeal. The low, wide appearance filled with both sharp lines and curves is offset by a low-riding, ready-to-pounce rear haunch; all of which is tied together by an edge line running from the front wheel to the rear quarter. Other design cues bring in this low, pouncing look with subtle emphasis. 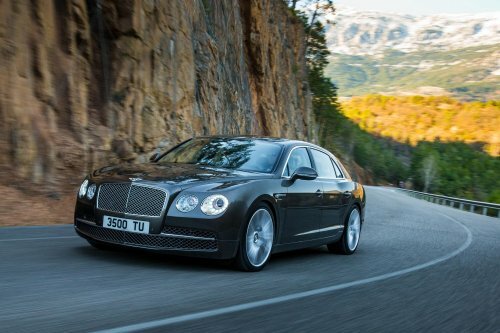 The headlamps are jeweled and slightly wider than the usual Bentley lighting, emphasizing the Flying Spur's low flow. The chrome grille is more upright than usual, pulled back slightly to denote speed. The car's side profile is swept from Big B front plate to the single ellipse LED tail lamps. Throughout, new materials and improved use of pedestrian crumple zones has lowered the car's weight by 50 kilos, which adds to both performance and economy. Inside, of course, is where it's at with a luxury sedan and Bentley knows full well how to properly outfit high end luxury vehicle. The Flying Spur features an almost entirely new build with class-leading entertainment and information tech under the dash along with the hand-crafted materials and design that Bentley is known for. The leather is, of course, exclusive to Bentley and offered in 12 different colors while newly-formed foam layering increases the comfort level on all four (or optional five) seats. Almost ten square meters of sustainably-sourced natural wood adorns the interior fittings and a new "wraparound" look for the dashboard creates a curve from door to door in a one-piece wood mantle. Owners can choose between burr walnut and fiddleback eucalyptus (dark). The new Bentley Flying Spur is definitely ready to showcase the company's re-emergence into the limelight of the luxury segment as Bentley continues its aggressive growth strategy.